We had one of C’s friend over for dinner tonight. Athi is really health conscious and I wanted to honor his dietary needs – so after some discussion, we settled on making some sort of chicken for dinner. I made sure we had the ingredients for two different recipes outta the Comfort Food Makeovers cookbook and when he arrived I let him choose which recipe. 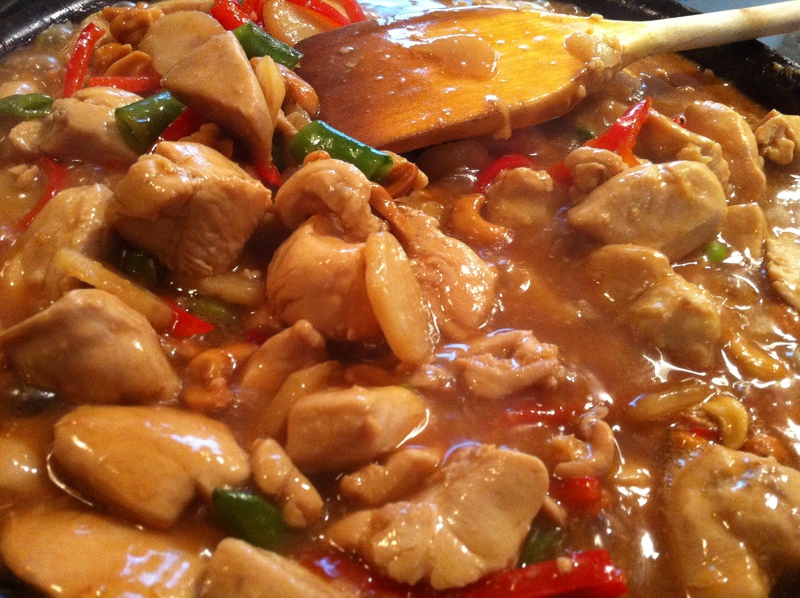 Cashew Chicken it is! I know, I know. Not a terribly coherent meal – two greek side dishes and a chinese entree, but it sure was DEEEELICIOUS! 2- On a baking sheet lay out the mushrooms and lemon wedges, shpritz with Pam or Olive Oil. 3- Whack into the oven for 30 minutes, stirring at the 15 minute mark. The mushrooms will brown but stay moist – which is awesome. 4- When the veg is done, pull it outta the oven. Let it cool for a few minutes while you’re heating up 1 teaspoon of Olive Oil and 1/2 teaspoon of salt in your big skillet. Scrape in the lemon (squeezing it a little to release the juice) and mushrooms into the heated skillet , then dump in the cleaned cherry tomatoes. Toss to coat, then turn off the heat. Dump in the spinach and toss. 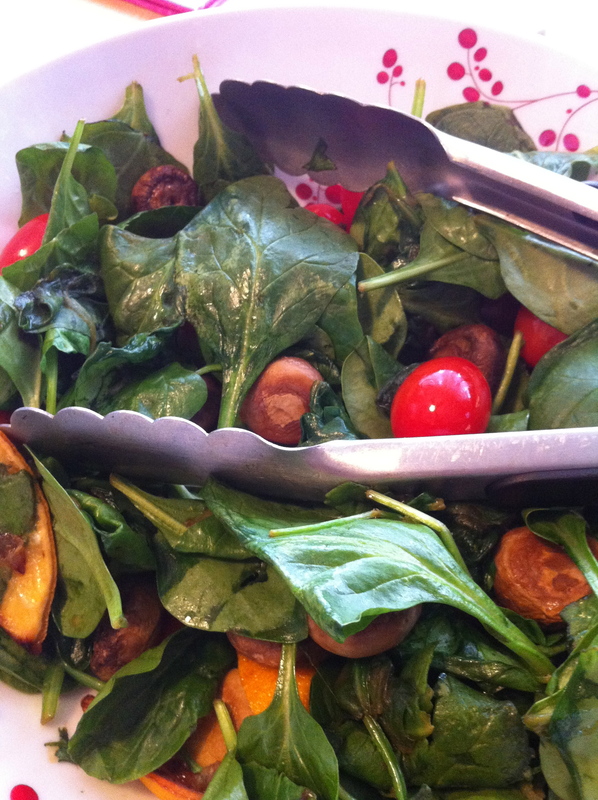 The residual heat of the mushrooms will wilt the spinach. Season lightly with salt and pepper and serve! **C thought this was a little too lemony. Try using only half the lemon if you’d like less. 1 teaspoon Olive Oil – make it the good stuff! 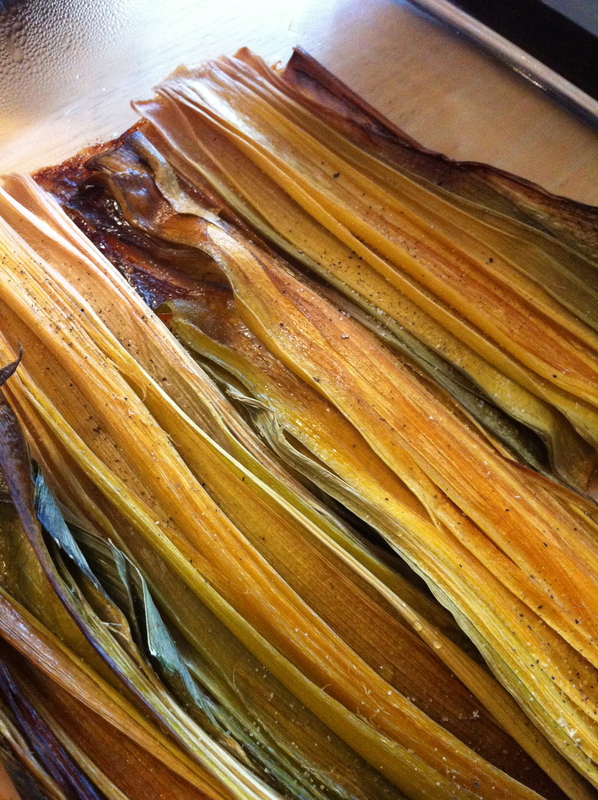 2- Lay your halved leeks into a baking dish. Drizzle with Olive Oil and cover with foil. 3- Whack into the oven and walk away. Come back in an hour and take them outta the oven. Season lightly with Salt and Pepper. Serve warm or at room temp. America’s Test Kitchen Strikes AGAIN! 1/4 cup Roasted, Unsalted Cashews, coarsely chopped. **This was meant to serve 4, but as we were serving three adults and 2 toddlers, I doubled everything. NOTE: This is meant to be served over rice. We didn’t, but we should have! 1- Whisk soy sauce, wine, cornstarch, and sugar together in medium bowl. Measure 2 Tablespoons of mixture into separate bowl and stir in 2 teaspoons sesame oil and chicken; let marinate for 10 to 30 minutes. Stir broth into remaining soy sauce mixture to make sauce; set aside. In separate bowl, combine garlic, ginger, pepper flakes, and remaining 2 teaspoons sesame oil. 2- Cook bell pepper and water, covered in 12″ nonstick skillet over high heat until water is boiling and pepper begins to soften, about 3 minutes. Uncover, add snow peas, and cook until water has evaporated and vegetables are crisp-tender, about 2 minutes; transfer to bowl. 3- Return now-empty skillet to medium-high heat.Add chicken with marinade, breaking up any clumps, and cook until lightly browned on all sides but not fully cooked, about 6 minutes. Clear center of skillet, add garlic mixture, and cook, mashing mixture into pan, until fragrant, 15 to 30 seconds. 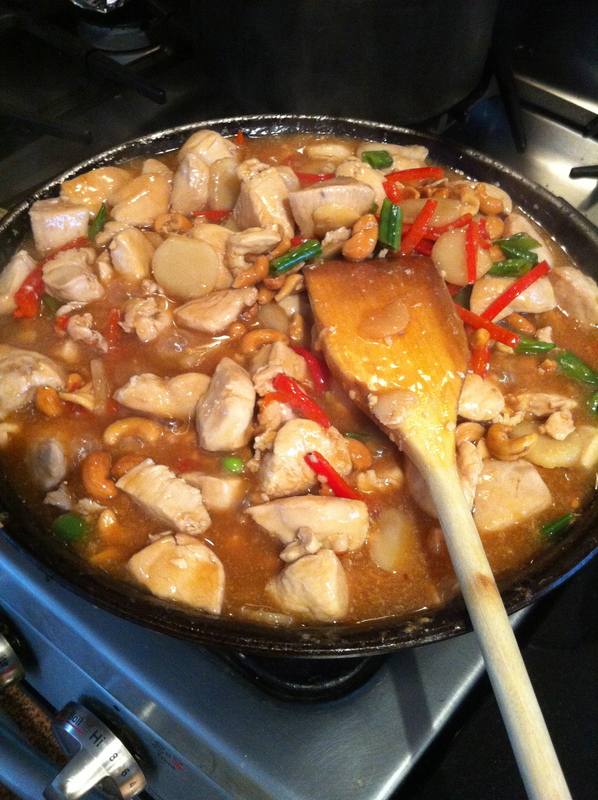 4- Stir in cooked vegetables, water chestnuts, and cashews. Whisk sauce to recombine and add to skillet. Simmer until chicken is cooked through and sauce is thickened, 30 seconds to 2 minutes. Serve. 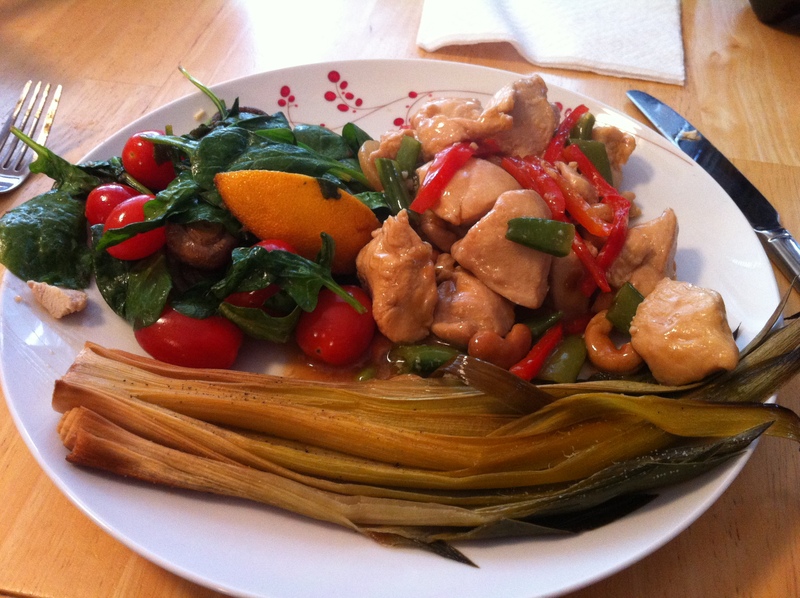 End Results: Leeks were DEVOURED, Mushrooms garnered mixed reviews, and the cashew chicken was good. Athi said the sauce was a little thin, C said serving it with rice might help by absorbing some sauce, and I think I coulda added a bit more cornstarch to thicken it. We had to wipe him, the highchair, the table and the FLOOR down after he was through. No point in doing it during – we waited til the end.